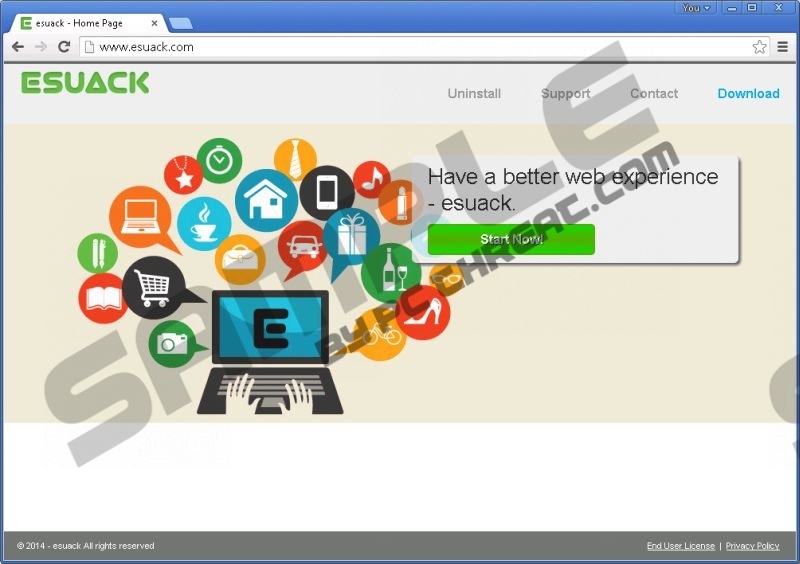 Esuack is an annoying adware application, made using the SuperWeb engine. This is clear after taking one look at its official website at esuack.com, which looks identical to all other adware made by SuperWeb LLC. Besides a download link, all it says on the website is, “Have a better web experience – Esuack”. This doesn’t inspire confidence at all. In fact, we’re quite sure that you will wish to remove Esuack from your computer not long after it starts working. Our adware removal instructions will certainly help you. Read on to find out more. Like most adware, Esuack works by gaining access to your web browser. It does this by inserting itself among your extensions. Once there, it starts tracking your browsing habits, paying special attention to the websites you like to visit, and things you search for, both in search engines and on online shopping websites. When enough information has been gathered, Esuack will start displaying targeted commercial advertisements in your web browser window. They could show up on specific websites, at specific times, or in certain geographic locations. It depends on the conditions set by its developers. One thing is certain, though. Before long, your will get annoyed by Esuack’s ads. The only way to get rid of them is to remove the program. While you can download Esuack on its official website, it’s more likely that you got it in a freeware bundle. These packages of software work by relying on computer user’s lack of attention to details while installing a free program. Often, people can’t wait to use the program they want, so they just agree to anything the installer asks of them, including installing applications like Esuack. This could be a dangerous thing to do, as these bundles are known to sometimes contain real threats to your computer. If you noticed Esuack on your system, we recommend removing it at once. To be perfectly safe, you should also get a professional spyware scanner to check your system for any other threats. When it comes to removing Esuack from your computer, we have to say that it’s not an overly difficult process. Nevertheless, we must urge you to scan your system for other threats with an antimalware program. It will find anything dangerous and remove it all with a simple click of your mouse button. If you insist on removing Esuack yourself, the instructions are provided below. Click Add or Remove Programs, find Esuack, and Remove it. Click Uninstall a program, find Esuack, and Uninstall it. Press Ctrl+Shift+A and go to Extensions. Select Esuack and click Remove. Quick & tested solution for Esuack removal.